For other uses, see Taras Shevchenko (disambiguation). This name uses Eastern Slavic naming customs; the patronymic is Hryhorovych and the family name is Shevchenko. Taras Hryhorovych Shevchenko (March 9 [O.S. February 25] 1814 – March 10 [O.S. February 26] 1861) was a dissident activist in Imperial Russia, and a Ukrainian poet, writer, artist, public and political figure, as well as folklorist and ethnographer. His literary heritage is regarded to be the foundation of modern Ukrainian literature and, to a large extent, the modern Ukrainian language. Shevchenko is also known for many masterpieces as a painter and an illustrator. He was a member of the Sts Cyril and Methodius Brotherhood and an academician of the Imperial Academy of Arts. In 1847 Shevchenko was convicted for writing in the Ukrainian language, promoting independence of Ukraine and ridiculing members of the Russian Imperial House. Taras Shevchenko was born on March 9 [O.S. February 25] 1814[Note b] in the village of Moryntsi, Zvenigorodka county, Kiev Governorate in the Russia (now in Zvenyhorodka Raion, Ukraine). After his sister Kateryna and brother Mykyta, he was the third child of serf peasants Hryhoriy Ivanovych Shevchenko (1782? – 1825) and Kateryna Yakymivna Shevchenko (Boiko) (1782? – August 6, 1823) who belonged to a landlord called Vasiliy Engelgardt. According to family legends, Taras's forefathers were Cossacks who served in the Zaporizhian Host and took part in liberation wars and uprisings of Ukraine in the 17th and 18th centuries. Those uprisings were brutally suppressed and normal social life was disrupted for many years in Cherkasy, Poltava, Kyiv, Bratslav, and Chernihiv. Most of the local population was enslaved and impoverished. In the fall of 1822 Taras started to take some grammar classes at a local precentor (dyak) Sovhyr. At that time Shevchenko became familiar with Hryhoriy Skovoroda's works. During 1822-1828 Shevchenko painted horses and soldiers. On July 4 [O.S. June 22] 1824 Taras's sister Maria from the second marriage of Hryhoriy Ivanovych was born. In 1824 Taras, along with his father, became a traveling merchant (chumak) and traveled to Zvenyhorodka, Uman, Yelizavetgrad (today Kropyvnytskyi). At the age of eleven Taras became an orphan when, on April 2 [O.S. March 21] 1825, his father died a serf in corvée. Soon his stepmother along with her children returned to Moryntsi. Taras went to work for precentor (dyak) Bohorsky who had just arrived from Kyiv in 1824. As an apprentice, Taras carried water, heated up a school, served the precentor, read psalms over the dead and continued to study. At that time Shevchenko became familiar with some works of Ukrainian literature. Soon tired of Bohorsky's enduring mistreatment, Shevchenko ran away to seek out a painting master in the surrounding villages. For several days he worked for deacon Yefrem in Lysianka, later in other places around in southern Kyiv Governorate (villages Stebliv and Tarasivka). In 1827 Shevchenko herded community sheep near his village. He then met Oksana Kovalenko, a childhood friend, whom Shevchenko mentions in his works on multiple occasions. He dedicated to her the introduction to his poem "Mariana, the Nun". As a hireling for the Kyrylivka priest Hryhoriy Koshytsia, Taras was visiting Bohuslav where he drove the priest's son to school, while apples and plums - to the market. At the same time he was driving to markets in the towns of Burta and Shpola. In 1828 Shevchenko was hired as a serving boy to a lord's court in Vilshana where he went for permission to study with a local artist. When Taras turned 14, Vasiliy Engelgardt died and village Kyrylivka became a property of his son, Pavel Engelgardt. Shevchenko was turned into a court servant of the new landlord at the Vilshana estates. On December 18 [O.S. December 6] 1829 Pavel Engelgardt caught Shevchenko at night painting a portrait of Cossack Matvei Platov, a hero of the Patriotic War of 1812. He boxed the ears of the boy and ordered him whipped in the stables with rods. During 1829-1833 Taras copied paintings of Suzdal masters. For almost two and a half years, from fall of 1828 to start of 1831, Shevchenko stayed with his master in Vilno (Vilnius). Details of the travel are not well known. Perhaps, there he attended lectures by painting professor Jan Rustem at the University of Vilnius. In the same city Shevchenko could also have witnessed the November Uprising of 1830. From those times survived Shevchenko's painting "Bust of a Woman" which indicates almost professional handling of the pencil. After moving from Vilno to Saint Petersburg in 1831, Engelgardt took Shevchenko along with him. To have a benefit from works of art (among the nobility there was a fashion to have their own "chamber artists"), he sent him to study for four years to painter Vasiliy Shiriayev. From that point and until 1838 Shevchenko lived in the Krestovsky building (today Zagorodnyi prospekt, 8) where Shiriayev rented an apartment. In his free time at night, Shevchenko visited the Summer Garden where he was portrayed statues. In Saint Petersburg he also started writing his poems. In 1833 Shevchenko painted a portrait of his landowner Pavel Engelgardt (National museum of Taras Shechenko). In his novel "Artist" Shechenko tells that during the pre-academical period he painted such works as "Apollo Belvedere", "Fraklete", "Heraclitus", "Architectural barelief", "Mask of Fortune". He participated in painting of the Bolshoi Theatre as artist apprentice. He created a composition "Alexander of Macedon shows trust towards his doctor Philip". The drawing was created for a contest of the Imperial Academy of Arts, announced in 1830. In Saint Petersburg Shevchenko met Ukrainian artist Ivan Soshenko, who introduced him to other compatriots such as Yevhen Hrebinka and Vasyl Hryhorovych, and to Russian painter Alexey Venetsianov. Through these men Shevchenko also met famous painter and professor Karl Briullov, who donated his portrait of Russian poet Vasily Zhukovsky as a lottery prize. Its proceeds were used to buy Shevchenko's freedom on May 5, 1838. In the same year Shevchenko was accepted as a student into the Academy of Arts in the workshop of Karl Briullov. Next year he became a resident student at the Association for the Encouragement of Artists. At the annual examinations at the Imperial Academy of Arts, Shevchenko was given a Silver Medal for landscape painting. In 1840 he again received the Silver Medal, this time for his first oil painting, The Beggar Boy Giving Bread to a Dog. Shevchenko began writing poetry while still a serf, and in 1840 his first collection of poetry, Kobzar, was published. According to Ivan Franko, a renowned Ukrainian poet in the generation after Shevchenko, "[Kobzar] immediately revealed, as it were, a new world of poetry. It burst forth like a spring of clear, cold water, and sparkled with a clarity, breadth and elegance of artistic expression not previously known in Ukrainian writing". In 1841, epic poem Haidamaky was released. 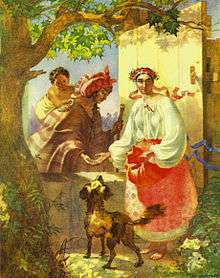 In September 1841, Shevchenko was awarded his third Silver Medal for The Gypsy Fortune Teller. Shevchenko also wrote plays. In 1842, he released a part of the tragedy Mykyta Haidai and in 1843 he completed the drama Nazar Stodolia. While residing in Saint Petersburg, Shevchenko made three trips to the regions of Ukraine, in 1843, 1845, and 1846. The difficult conditions under which his countrymen lived had a profound impact on the poet-painter. Shevchenko visited his siblings, still enserfed, and other relatives. He met with prominent Ukrainian writers and intellectuals Yevhen Hrebinka, Panteleimon Kulish, and Mykhaylo Maksymovych, and was befriended by the princely Repnin family, especially Varvara Repnina. On March 22, 1845, the Council of the Academy of Arts granted Shevchenko the title of an non-classed artist. He again travelled to Ukraine where he met with historian Nikolay Kostomarov and other members of the Brotherhood of Saints Cyril and Methodius, a clandestine society also known as Ukrainian-Slavic society and dedicated to the political liberalization of the Empire and its transformation into a federation-like polity of Slavic nations. Upon the society's suppression by the authorities, Shevchenko's poem "The Dream" (Son), that was confiscated from the society's members, became one of the major issues of the scandal. Shevchenko was arrested along with other members of the society on April 5, 1847. Tsar Nicholas read Shevchenko's poem, "The Dream". Vissarion Belinsky wrote in his memoirs that, Nicholas I, knowing Ukrainian very well, laughed and chuckled whilst reading the section about himself, but his mood quickly turned to bitter hatred when he read about his wife. Shevchenko had mocked her frumpy appearance and facial tics, which she had developed fearing the Decembrist Uprising and its plans to kill her family. After reading this section the Tsar indignantly stated "I suppose he had reasons not to be on terms with me, but what has she done to deserve this?" In the official report of count Orlov Shevchenko was accused of using Little-Russian language (archaic Russian name for Ukrainian language) of outrageous content instead of being grateful to be redeemed out of serfdom. In the report Orlov claims that Shevchenko was expressing a cry over alleged enslavement and disaster of Ukraine, glorified the Hetman Administration (Cossack Hetmanate) and Cossack liberties and "with incredible audacity poured slander and bile on persons of Imperial House". While under investigation, Shevchenko was imprisoned in Saint Petersburg in casemates of the 3rd Department of Imperial Chancellery on Panteleimonovskaya Street (today ulitsa Pestelia, 9). After being convicted, he was exiled as a private to the Russian military garrison in Orenburg at Orsk, near the Ural Mountains. Tsar Nicholas I, confirming his sentence, added to it, "Under the strictest surveillance, without the right to write or paint." He was subsequently sent on a forced march from Saint Petersburg to Orenburg where, at the suggestion of fellow serviceman Bronisław Zaleski, General Perovsky assigned him to Karl Ernst von Baer, a Baltic-German naturalist. Von Baer was a rising star in the Academy of Sciences in Saint Petersburg and was becoming increasingly influential in the exploration of the new Russian territories, specializing in lakes and fisheries. He had been selected to undertake the first scientific expedition of the Aral Sea on the ship "Konstantin", under the command of Lieutenant Butakov. Although officially a common sailor, Shevchenko was tasked with sketching the various landscapes around the coast of the Aral Sea, including the local Qazaq nomads, and was effectively treated as an equal by the other members of the expedition. After a voyage of over eighteen months (1848–49) he returned with his album of drawings and paintings to General Perovsky at Orenburg, who was impressed with his work and sent a positive report to Saint Petersburg hoping to obtain some amelioration in Shevchenko’s punishment. However Perovsky was reprimanded and Shevchenko’s punishment was increased to imprisonment. He was sent to one of the worst penal settlements, the remote fortress of Novopetrovsk in the mouth of the Syr Darya, where he spent six terrible years of mental and physical torment. 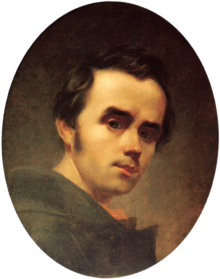 Taras Shevchenko spent the last years of his life working on new poetry, paintings, and engravings, as well as editing his older works, but after his difficult years in exile his final illness proved too much. 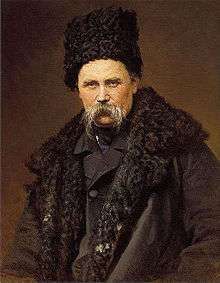 Shevchenko died in Saint Petersburg on March 10, 1861, the day after his 47th birthday. Dogged by terrible misfortune in love and life, the poet died seven days before the Emancipation of Serfs was announced. His works and life are revered by Ukrainians throughout the world and his impact on Ukrainian literature is immense. Outside of Ukraine and the former USSR, monuments to Shevchenko have been put up in many countries, usually under the initiative of local Ukrainian diasporas. 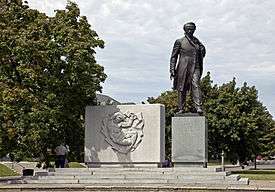 There are several memorial societies and monuments to him throughout Canada and the United States, most notably the monument in Washington, D.C., near Dupont Circle. The granite monument was carved by Vincent Illuzzi of Barre, Vermont. There is also a monument in Soyuzivka in New York State, Tipperary Hill in Syracuse, New York, a park is named after him in Elmira Heights, N.Y. and a street is named after him in New York City's East Village. A section of Connecticut Route 9 that goes through New Britain is also named after Shevchenko. A monument to Shevchenko was put up in Zagreb, Croatia on May 21, 2015. 835 works survived into modern times in original form and partly in prints engraved on metal and wood by Russian and other foreign engravers, while some works survived as copies done by painters while Shevchenko still lived. There is data on over 270 more works which were lost and have not been found yet. Painted and engraved works at the time of completion are dated 1830-1861 and are territorially related to Ukraine, Russia and Kazakhstan. The genres are - portraits, compositions on mythological, historical and household themes, architectural landscapes and scenery. 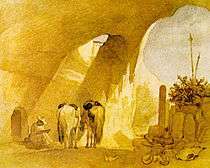 The techniques used for that were oil painting on canvas, watercolor, sepia, inking, lead pencil, as well as etching on separate sheets of white, colored and tinted paper of different sizes and in five albums. A significant part of Shevchenko's artistic heritage consists of completed paintings, however there are also sketches, etudes and outlines which are no less valuable for understanding Shevchenko's methods and artistic path. Of all Shevchenko's paintings only a small part has any authorial signatures or inscriptions and even smaller part has dates. ↑ Shevchenko, T. To Osnovianenko. Collection of works: in 6 volumes. Kiev: Izbornik, 2003. Vol.1: Poetry 1837-1847. 119-121, 623-628. Print. 1 2 3 4 5 6 7 8 Витяг зі справи М. І. Гулака - № 69. Доповідь О. Ф. Орлова Миколі I про діяльність Кирило-Мефодіївського Товариства і пропозиції щодо покарання його членів [Excerpt from the file of M. I. Gulak - No.69. Report by A. F. Orlov to Nicholas I on the activities of Cyril and Methodius Brotherhood and suggestions for the punishment of its members] (in Russian). Litopys. 26 May 1847. Archived from the original on 19 February 2015. Retrieved 11 July 2014. 1 2 3 Shevchenko Dictionary in two volumes. Shevchenko Institute of Literature (Academy of Sciences of the Ukrainian SSR). Kiev: Main Edition of the Ukrainian Soviet Encyclopedia, 1976-1978. 1 2 3 "Shevchenko, Taras". Encyclopedia of Ukraine. Retrieved March 22, 2007. ↑ Сон [The Dream] (in Ukrainian). Litopys. Archived from the original on 19 February 2015. ↑ Belinsky, Vissarion (December 1847). Письмо В. Г. Белинского к П. В. Анненкову [Letter from V. G. Belinsky to P. V. Annenkov] (in Russian). Litopys. Retrieved 13 November 2016. ↑ Karevin, Aleksandr (6 August 2012). Мифы Украины: украинский "соловей" [The myths of Ukraine: the Ukrainian "nightingale"] (in Russian). RusskoeDvizhenie.rf. Retrieved 13 November 2016. ↑ Андрій Тіток (6 December 2014), Остання путь Кобзаря: як Чернігівщина прощалася з Тарасом Шевченком. SVOBODA.FM. ↑ Utevskaya, Paola; Dmitriy Gorbachev (August 1997). 'Он мог бы понять самого Пикассо' ['He could have understood Picasso himself']. Zerkalo Nedeli (in Russian). zerkalo-nedeli.com. 30 (147). Archived from the original on 18 January 2005. ↑ Ayres, Sabra (March 9, 2014). "In divided Ukraine, inspiration from a poet of the underdog". The Christian Science Monitor. Retrieved 15 March 2014. ↑ Uzhankov, Alexander (11 February 2009). "Шевченко – русский писатель?". Stoletije. ↑ Kosmeda, T.A. (2007). "Дневник Т.Г. Шевченко - отражатель его русскоязычного сознания" (PDF). Ученые записки Таврического национального университета имени В.И.Вернадского. 20 (59). ↑ Wanner, Catherine (1998). Burden of Dreams: History and Identity in Post-Soviet Ukraine. Penn State Press. ↑ "Testament. Taras Shevchenko's poems in English". dinternal.com.ua. Retrieved 4 June 2015. ↑ Taras Shevchenko: Documents and materials to biography. 1814-1861. Ed. Ye.Kyryliuk. Kiev, 1982. 6-45. Print. 1 2 Letters to Taras Shevchenko. Kiev: Naukova dumka, 1993. ↑ Great Soviet Encyclopedia. 3rd ed. "Soviet Encyclopedia". 1969-1978. 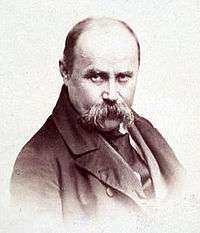 Wikimedia Commons has media related to Taras Shevchenko.